The Grapevine (2/15/16): Et Tu, Rey-Rey? - Smark Henry | The voice of Filipino wrestling fans | Philippine Wrestling Revolution, WWE, and more The Grapevine (2/15/16): Et Tu, Rey-Rey? The Grapevine (2/15/16): Et Tu, Rey-Rey? Good morning everyone, and welcome to the Grapevine! This is our daily post rounding up all the interesting rumors from the wild, wild world of pro wrestling that you may have missed over the weekend. We say: What the hell is going on with AAA? 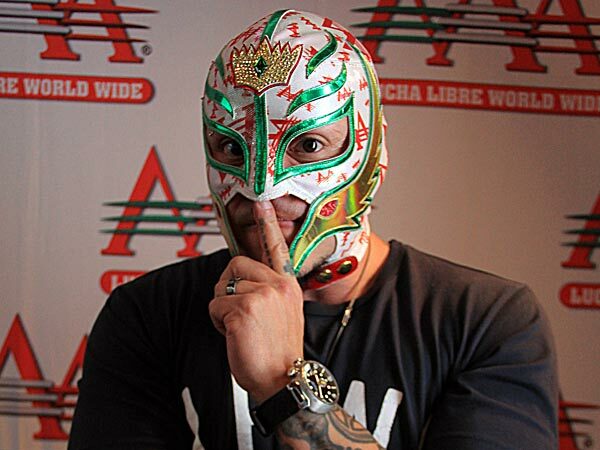 Rey Mysterio returning to WWE would hurt Lucha Underground the most. LU needed the star power of someone like Rey Mysterio to get the attention of the mainstream American wrestling audiences, and losing him will be a big blow to the best show in wrestling today. Rey won't really have a place in WWE anymore these days now that Kalisto's taken his old spot, plus all the WWE travel is only going to beat Mysterio's body up even more. At this point, a WWE run for Rey isn't exactly going to help either party. Awesome Kong is teasing a WWE return. She's been posting pictures and clips of herself on her Instagram account as Kharma from her time in WWE. This comes shortly after she had been fired by TNA after a backstage incident involving her and Reby Sky. We say: We'd love to have Awesome Kong/Kharma back in the WWE. She could very well come in and fill the monster heel role that she was supposed to have in 2011. We hope the stars align for a second WWE run for the woman known as Kia Stevens in real life. We say: This has the potential to be the best celebrity WrestleMania moment of all-time. Stephen Amell has shown he can more than hold his own in a WWE ring, plus he and Stardust have developed excellent chemistry over the last year. Do not fail this universe, WWE. What do you think? Should Rey Mysterio return to the WWE? How excited will you be for a one-on-one match between Amell and Stardust at WrestleMania Star? Let us know what you think in the comments!